Home / News / Never joke with UHURU! See how he chased MURATHE from Jubilee like a stray dog for touching on his trusted Deputy, RUTO? Never joke with UHURU! See how he chased MURATHE from Jubilee like a stray dog for touching on his trusted Deputy, RUTO? 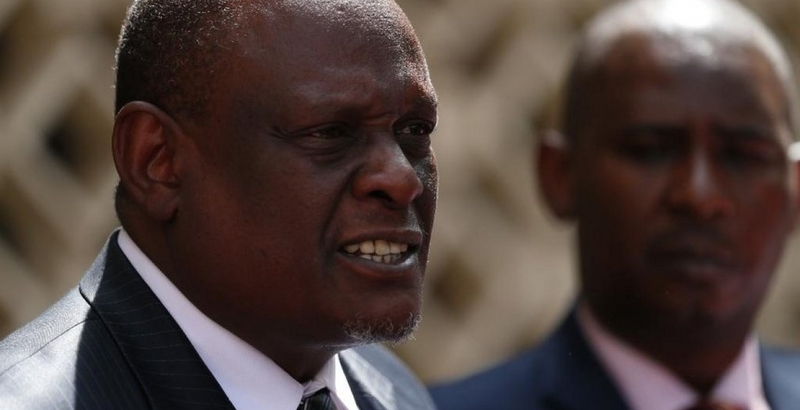 Wednesday January 30, 2019-National Assembly Majority Leader, Aden Duale, has claimed that former Jubilee Party Vice Chair, David Murathe, did not leave the party on his own accord but was chased out by none other than President Uhuru Kenyatta for antagonizing Deputy President William Ruto. Speaking yesterday, Duale revealed that the former Gatanga MP was actually chased out if the party by the party leadership over his remarks against the DP contrary to earlier reports that he had resigned on his own volition. "As members of the party we thought that his remarks contravened the party standards and decided that he had to go," said Duale. "The Party Leader (Uhuru) dismissed him too and he had to go," he added. Murathe shot into the limelight last year when he poked holes into Deputy President William Ruto's 2022 presidential bid during the Maragoli Cultural Festival in Vihiga County, vowing to block him by any means necessary from succeeding Uhuru.